Note this revised title from phase 2 appears in Kotter's 1995 HBR article. The original title (from the book Leading Change) was: Creating the Guiding Coalition. While this may not seem like a change of great magnitude, it is. The word power tells us why most change initiatives fail at Kotter's phase 2. In traditional change management projects, the power resides with the golden few, while the rest of the organization ends up power-less. In Kotter's phase 1, the organization crafts a change and attempts to "create a sense of urgency" for that change. The problem with phase 1 (another post) is that people resist what they have no hand in creating. The mistake is often change agents attempting to impose a sense of urgency. In phase 2, the organization scopes a change initiative, choosing a select-few to be involved in "guiding" the change effort. 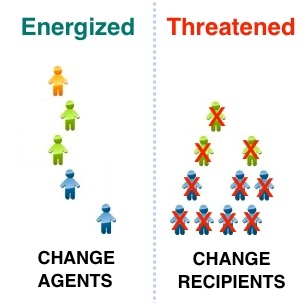 The select few change agents (leaders, implementers & facilitators) are energized by their involvement and participation. The change recipients (most employees and middle managers) are de-energized by their lack of meaningful involvement and active participation. A truly representative advisory group is more powerful than you think. They are able to use their role as "representatives" to deliver realistic news to the leadership team regarding the employee and middle manager perspective of the change initiative. It is a much different dynamic than created by the traditional core team in most initiatives. This team often loses their perspective when put on a special assignment for the initiative. Kotter was right to insert the term power into his phase 2 (a.k.a. error #2). 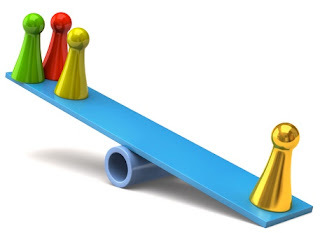 If the top leaders have nobody to provide a "check and balance" to their power, they are likely to let that power go to their head, often thinking, "if I see things this way, everybody else must see it this way too." Second, the rest of the organization feels empowered when they find out that the advisory team was responsible for any changes to the original top leadership plan. If you choose the advisory correctly (using the right selection criteria), the grapevine spreads this word in a way the communications folks could never do! I've actually had good success in this area. The key is to shift out of the parent-child mode into adult-adult mode. Too often, we "confess each other's sins" in organizations without holding up the mirror. If the advisory group is in the role of child complaining about their parent, they'll say childish things and commit job suicide. 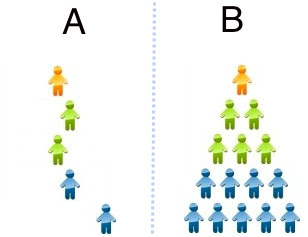 I'll introduce a 4-point formula below ... and show how to mitigate the risk. The trick for an advisory group is to begin with articulating (1) change sponsor's contribution to the problems, and then (2) what (specifically) the change sponsor needs to do differently, e.g. start/stop/continue. THEN ... the advisory group needs to turn the mirror on themselves as (a) employees and (b) middle managers. Same things ... (3) what are a & b's contributions to the change problems, and (4) what do a & b need to do differently, e.g. start/stop/continue. THE KEY is flipping the order when presenting to the leadership group. START with (3) here is what all of us under you are doing wrong, and (4) here is what we propose we do to fix that. LEADERSHIP TEAMS LOVE THIS ... when those under them take accountability for the things the LT is already discussing and complaining about behind closed doors. THAT's when you continue the presentation with "oh by the way ... we have some things we need you to do as well." Here is (1) what you're doing to contribute to the problem, and (2) what we REQUEST you do differently. I'll go into greater depth in a future post. Granted ... there is an exception to every rule ... I'm sure there may be some dysfunctional (i.e. family run) leadership teams where this still wouldn't work, but I know in Fortune 500 organizations this has been VERY effective for me in the past 15 years since I used it with an engineering group launching a new engine plant in Brazil for Chrysler.